A new event on the social calendar took place the weekend before Christmas. The Christmas Jumper Row was devised and organised by Vanessa as a fun festive occasion to start off the holiday season by engaging members with the added spice of an element of competition. 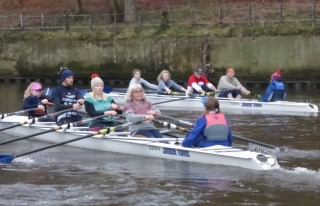 Timed to take place after Saturday morning training and followed by a buffet lunch it attracted 25 entries from Juniors, Masters and daytime rowers suitably bedecked in festive attire. 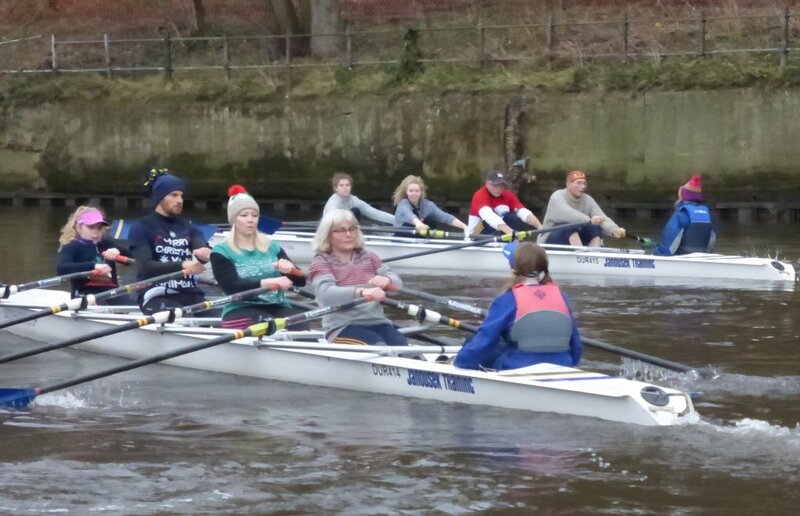 Five teams of 5 were drawn and assigned to mixed teams for races to Baths Bridge and back in stable quads. A fun time ensued with crews setting off from the landing stage in pairs and then landing at designated points to answer Christmas trivia questions, before continuing. The winning crew was declared according to a combination of race time and quiz score. After some close racing a clear winner emerged thanks to their 100% quiz score. The judges also awarded men’s and women’s prizes for the most stylish jumpers to Roger (enjoying some light relief after victory in the Olympic Velodrome the previous weekend) and Paddy, before everyone retired to the bar to enjoy a festive buffet. This entry was posted in Event News on December 22, 2015 by Colin Lawson.